NEW Click banner to submit/search the Project! If you find something helpfull to you on my site, please think about donating. I do pay for most of the info that I have posted to this part of the site. Apparently my Grandpa, Robert Mitchell is one of the people in this photo. He would have been between 15-16 in 1914.Depending on which exact year the photo was taken. The writing on the back makes reference to Robert being one of these 'nuts' - So my best guess is that the photo had been taken at a time when my Grandpa was at that location, then the person who sent it to him mailed it to him afterwards. HOWEVER that seems far-fetched. The person who wrote the card was (best guess), Samuel Sutherland, who lived at 26 Rhymer Street, Glasgow, and seems to have been traveling. 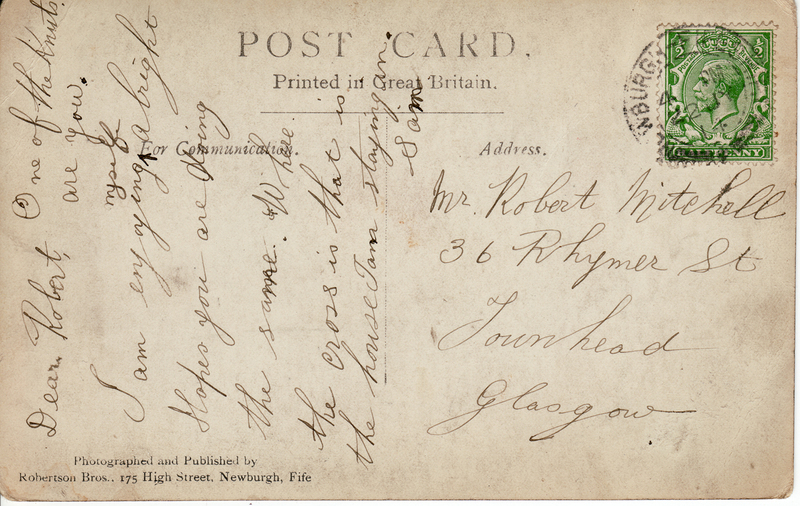 Sent to Robert Mitchell, who lived at 36 Rhymer Street, Glasgow - but then settled in Toronto Canada. Robert Mitchell married Samuel Sutherland's sister named Christine Wetherspoon Sutherland. For a more detailed view, click here (large file), then you can click the image again to magnify. You can even see the faces. For a view of the back of the card, click here. 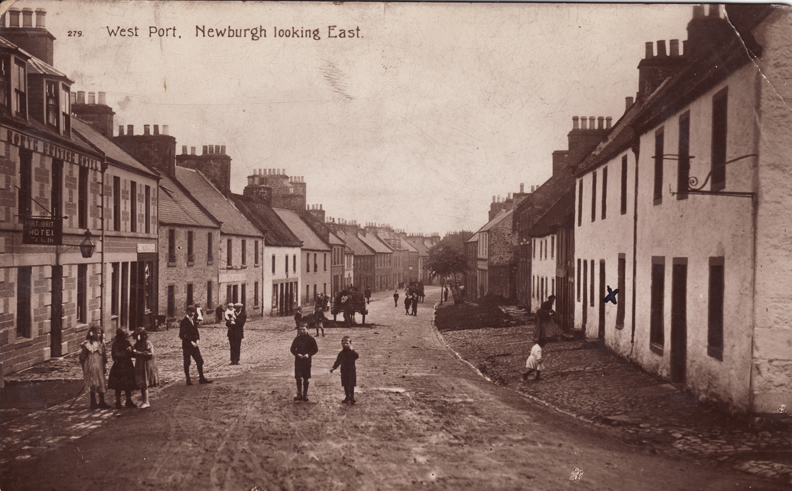 Photo taken and published by Robertson Brothers, 175 High Street, Newburgh, Fife. The building on the left was called "The North British Hotel". The X on the page is where Sam was lodging at the time he sent the postcard. "In 1871 (a) Robert Mitchell had a licence transferred to him from Alexander Reid of the West Port Inn and Hotel in Newburgh. Robert was in troble with the magistrates by July 1872 when he was convicted of a first offence. The next year he committed a Sunday offence and was warned if he committed another his licence would b refused. Records show he kept his licence until 1877, after which date his name disappeared." I found this picute at scran.ac.uk so I thought I would post, and create a little history about this corner of the world. 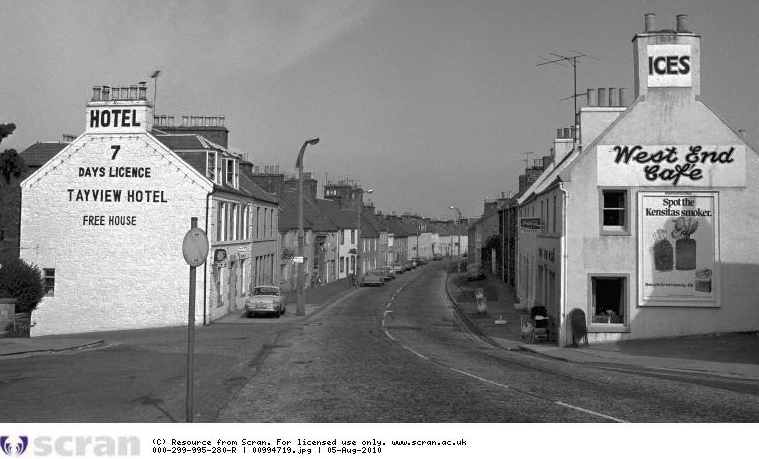 The Tayview Hotel (left), formerly the North British Hotel, was built in the early 19th century. The building on the right is a cafe run by the De Vito family. It was the place where young people would gather and listen to music on the jukebox. The cafe is now closed, and was converted to an antique shop in 1999. The hotel remains in business. The photo was probably taken in the 1960s. The De Vito family came to Scotland in the 1930s. They also owned a chip shop in the town centre. The head of the family was called Chiseto De Vito, his nickname was "Cheesies" and the West End Cafe also became known by this name across the town. Cheesie's ice cream was well known in the area and his cafe became a regular stopping place for people out on a weekend trip. After Cheesie and his wife died the business was passed down to his family until it was sold by the last retiring member - due to illness. Google made a driving video of this corner. At the time the Tayview Hotel was being called the Tayview Pub & it's across from Henderson Dark Antiques. 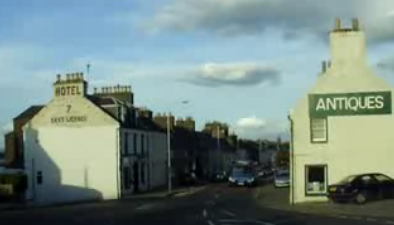 Google says: "A quiet roll through Newburgh High Street Scotland. 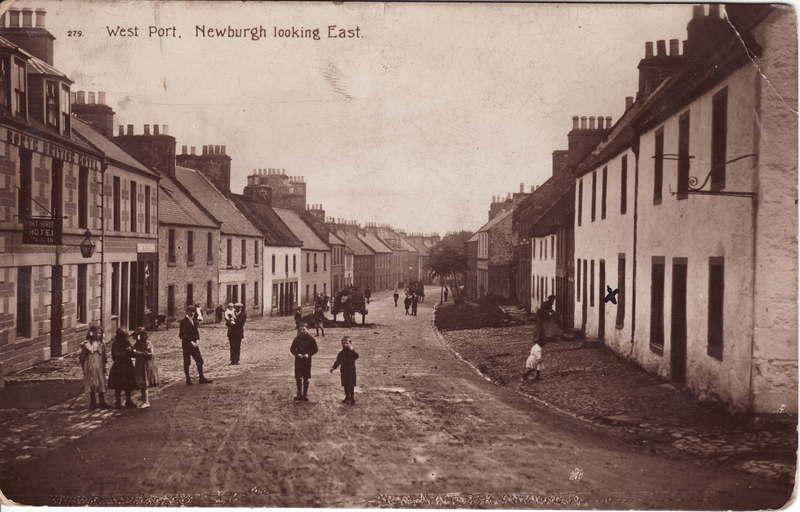 1st Bowling green, Tayview Pub across from Henderson Dark Antiques, Tower Bakery left. Masonic Hall and Co-op Right, Last Orders on the left just before zebra crossing then post office, Steeplearts centre right, Ship Inn and Newsagents left, Bear Tavern right, Chemists Sharons Hair Salon left, Abbey inn and West port Garage left, Primary School right and we made it to Abbey Garage. Phew!" A Google streetview of the same corner saved in August 2010 (don't know when the shot was taken). Shows that the previous business on the right corner has gone from being an Antique Shop in 1999 to now being the "Hatters Tea Room and Ice Cream Parlour". Hatters is located at 241 High Street, Newburgh Fife, Scotland, we are a small family run business incorporating our Shabby Chic Alice in Wonderland inspired Tea Room and Ice Cream Parlour with our expanding out side catering service. Due to our small size and big passion we can offer a very personal yet professional service. We keep up with all the modern trends but our main emphasis is on delicious home cooked food, whether it be contemporary or traditional. We have a full planning service to help you create a unique menu for your special occasion or you can simply order from one of our pre-set menus, if you require minimum fuss. From an old fashioned tea party; for a special birthday; to a trendy spoon canapés for a launch party; we promise to delight! Visit Hatters Catering on the web at hatterscatering.com. Some other interesting tidbits about this corner. 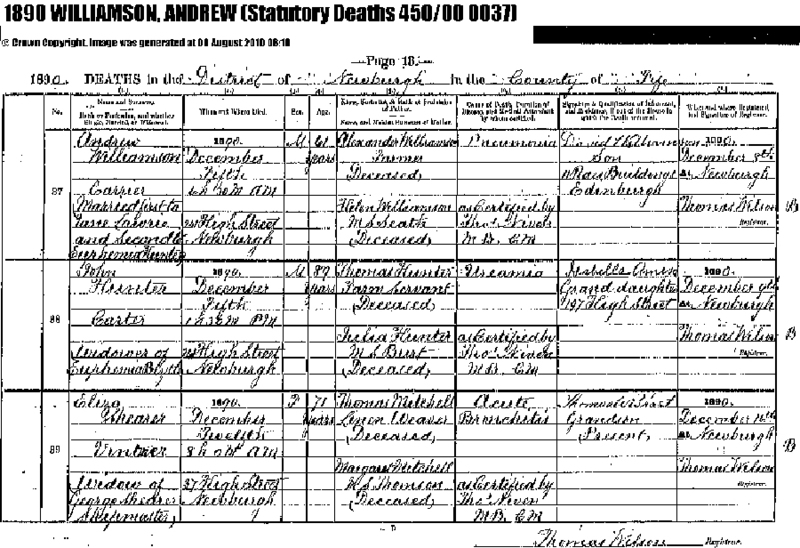 Andrew Williamson died at 241 High St. Newburgh, Fife. He had two wives. The first was Jean Lawrie, they were married on 31st Mar 1848 at Abernethy. His second wife was Euphemia Hunter, they were married 20th Feb 1878 in Perth. Andrew Williamson was a Carter. He passed away of Pneumonia at the age of 61. His son David Williamson who was living at 11 Raes Buildings in Edinburgh at the time, was the informant on his death record. 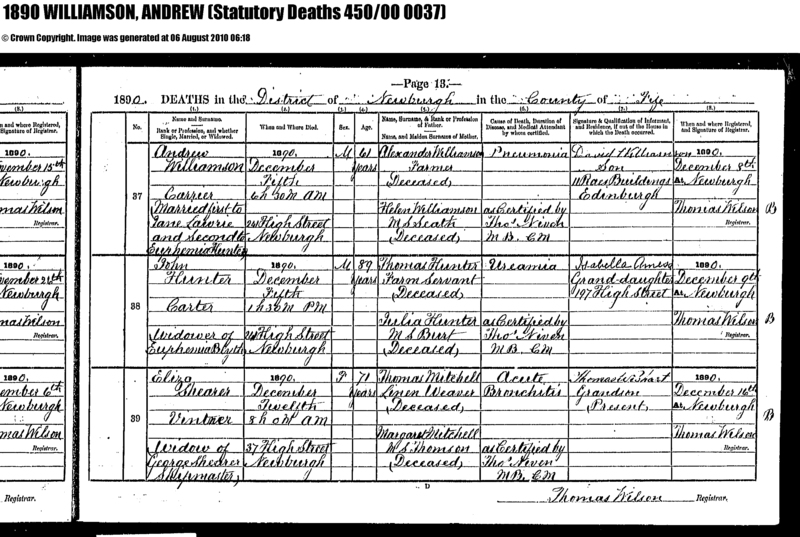 Andrew's parents were, Alexander Williamson, farmer & Helen Seath. Click here for lager file, easier to read. John Hunter died at 241 Hight St. Newburgh, Fife. He was the widower of Euphemia Blyth. He was a Carter. He passed away of Ureamia at the age of 89. His Grand Daughter Isabella Amess who was living at 197 High Street, Newburgh at the time, was the informatant on his death record. John's parents were, Thomas Hunter, Farm Servant & Julia Burt. Based on the names & the addresses ONLY I would say that John Hunter is probably related to Euphemia Hunter, the second wife of Andrew Williamson (probably her father, but further investigating is needed). Document included. Click here for lager file, easier to read. Eliza Mitchell (Could be Elizabeth Mitchell), Widow of George Shearer, (Shipmaster). Therefore also known as Eliza Shearer (Elizabeth Shearer) passed away at 37 High Street, Newburgh, Fife, at the age of 71. At the time of her death she was a Vintner. She died of accute bronchitis. Her parents were, Thomas Mitchell & Margaret Thomson, both were deceased by the time Eliza died. Thomas was a Linen Weaver. Thomas Wishart Grandson was the informant on the death record. Click here for lager file, easier to read.